Playing a short stack isn’t the end of the world, but it’s something that can leave you very vulnerable in a very big hurry! Why is that, though? Why do players find themselves with fewer chips than everyone and they either get creamed or they make a glorious comeback? Timing, selection, and image — of course, this is just being general. Let’s look at these things a bit further. If you’re at a cash table and you’re trying to build up your chips again, it’s something that you must realize everyone knows you’re up to. It’s something that they would do in your shoes, so you have to make sure that you’re not completely telegraphing each and every move. If you’re down in chips with a tournament, then be prepared for increased aggression. After all, you’re in another players way when it comes to achieving victory. This means that they really have to make sure that you’re not going to keep them from getting what they really want. It’s not something that you want to really deal with forever, so breaking out of the short stack is very key. Thankfully, poker is a matter of both strategy and luck. Don’t try to chase luck — it’ll backfire and your chips will decrease even further. Getting busted out isn’t something that you really want to deal with if you can help it. It’s better to make sure that you figure out exactly how to get through things as much as possible. Don’t play hands that you have to chase the river to win. A lot of players put themselves in a very bad bind trying to get that straight draw or trying to get that flush draw. If it’s not happening for you, chances are good that catching the card you need on the river just isn’t going to happen. This is even more the case if you have other players in the pot raising the daylights out of you. There’s a time and a place to fold. When you are the lowest chip count at the table, you need to be playing only premium hands. Playing just any old hand is a recipe for disaster. We know that we just said that, but it bears repeating. This is why so many people get bounced out of a tournament early. They end up making a Hail Mary of a play, which backfires horribly. Then with half the stack of everyone else, they try to scramble to get it back. Take your time. It’s okay to take a while to get your stack back to where it should be. Slowly playing the right hands is a lot better than trying to think about playing these big sweeps to get a bunch of chips at once. If you’re lured into going all in or getting otherwise pot committed, then the game is up. 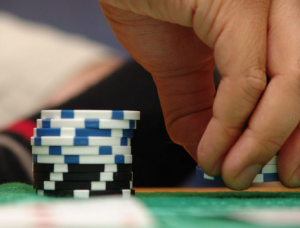 Thinking through these things will make you a much better poker player, we promise. If you aren’t doing it already, you need to be getting the full hand history of when you were so short stacked in the first place. Studying the history of your play will keep these situations from happening over and over again. Good luck and keep playing!